Twig II met April 8 at Van Wert Health, with hostess Beverlee Profit greeting 30 members and two guests. Invocation was given by Linda Stemen with lunch being served by Van Wert Health. Van Wert Health Director of Obstetrics Dawn Rhoades, RN, the meeting’s guest speaker, was introduced by Sharon Witten. Rhoades spoke on the “Safe Haven Baby Box Drop Off”, which is located on the outside of the back wall of Van Wert Health. The drop off box is a “safety deposit for babies” to save a baby from crisis and getting harmed. There are no cameras or questions asked. When the door is opened, a bassinet is available to lay the baby in. After the baby is laid in the bassinet, an alarm will sound in the Emergency Room, at which time a responder will respond to the alarm in 2 minutes or less. 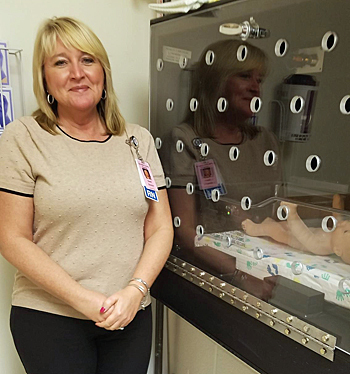 Van Wert Health has not had a baby dropped off as of this time, but hospital staff is prepared when it happens. Rhoades took time to show Twig II the baby box. Chairman Kathy Keysor opened the business meeting with roll call being answered with “Favorite Form of Entertainment”. Guests Joan Oberlitner and Mary Anne Padden were introduced by Beverlee Profit and Sharon Witten. Jane Broman needs to know of any conflicts in scheduling by the May meeting for schedule dates July 8 through September 14. May meeting’s topic is” Entertainment is Us” with Tafi Stober, incoming Niswonger Performing Arts Center executive director, as the guest speaker. Hostess will be Nancy Wolverton, with Joy McCleery giving the invocation. Those attending were Barbara Adams, Sandy Amundson, Sharon Bolenbaugh, Jane Broman, Diana Crow, Cheryl Dray, Judy Fox, Del Free, Diane Haller, Connie Hart, Linda Heath, Ella Jackson, Judy Jackson, Arlene Keysor, Kathy Keysor, Shirley Lichty, Judy Linton, Joy McCleery, Bev Mercer, Corrine Mowry, Joyce Oechsle, Doris Price, Sue Price, Beverlee Profit, Evelyn Schwartz, Katy Sill, Shirley Soldner, Barbara Sunderland, Sharon Witten, and Nancy Wolverton.